Emerging out of Blair's Britain in the late 90s as an antidote to post-industrial unemployment, early creative industries discourse was notable for a promotional hype characteristic of the dot.com era in the US. Over the past 3-5 years creative industries has undergone a process of internationalisation and become a permanent fixture in the short-term interests that define government policy packages across the world. At the policy level, creative industries have managed to transcend the North-South divide that preoccupied research on the information economies and communication technologies for two decades. Today, one finds countries as diverse as Austria, Brazil, Singapore and New Zealand eagerly promoting the promise of exceptional economic growth rates of "culture" in its "immaterial" form. Governments in Hong Kong, Japan, Australia, and the Netherlands have initiated creative industries policy platforms with remarkably similar assumptions and expectations given their very different cultural and political environments. Despite the proliferation of the creative industries model, it remains hard to point to stories of actual "creative innovation", or to be even sure what this might mean. What is clear – if largely unacknowledged – is that investment in "creative clusters" effectively functions to encourage a corresponding boom in adjacent real estate markets. Here lies perhaps the core truth of the creative industries: the creative industries are a service industry, one in which state investment in "high culture" shifts to a form of welfarism for property developers. This smoke and mirrors trick is cleverly performed through a language of populist democracy that appeals to a range of political and business agents. What is more surprising is the extent to which this hype is seemingly embraced by those most vulnerable: namely, the content producers (designers, software inventors, artists, filmmakers, etc.) of creative information (brands, patents, copyrights). Much research in the creative industries is highly speculative, interpretive and economistic, concerned with large-scale industry data rather than the network of formal and informal relations that make possible creative production. It is also usually produced quickly, with little detailed qualitative analysis of the structure of economic relationships creative industries firms operate in. In many cases, the policy discourses travel and are taken up without critical appraisal of distinctly local conditions. In contrast to the homogeneity of creative industries at the policy level, there is much localised variation to be found in terms of the material factors that shape the development of creative industries projects. For example, a recent UNCTAD (2004) policy report on creative industries and development makes note of the “‘precarious”’ nature of employment for many within the creative industries. Such attention to the uneven and variable empirics of creative industries marks a departure from much of the hype that characterised earlier creative industries discourse, and also reflects the spread of this discourse out of highly developed market economies to ones where the private sector has a very different role. This conference wishes to bring these trends and tendencies into critical question. It seeks to address the local, intra-regional and trans-national variations that constitute international creative industries as an uneven field of actors, interests and conditions. The conference explores a range of key topics that, in the majority of cases, remain invisible to both academic research and policy-making in the creative industries. Overall, the conference adopts a comparative focus in order to illuminate the variability of international creative industries. Such an approach enables new questions to be asked about the mutually constitutive tensions between the forces, practices, histories and policies that define creative production, distribution and organisation within an era of information economies and network cultures. >from * MyCreativity: Convention on International Creative Industries Research* Amsterdam, November, 16-18 , 2006. > nau21, towards a new public domain. creative spaces + production spaces + social spaces. 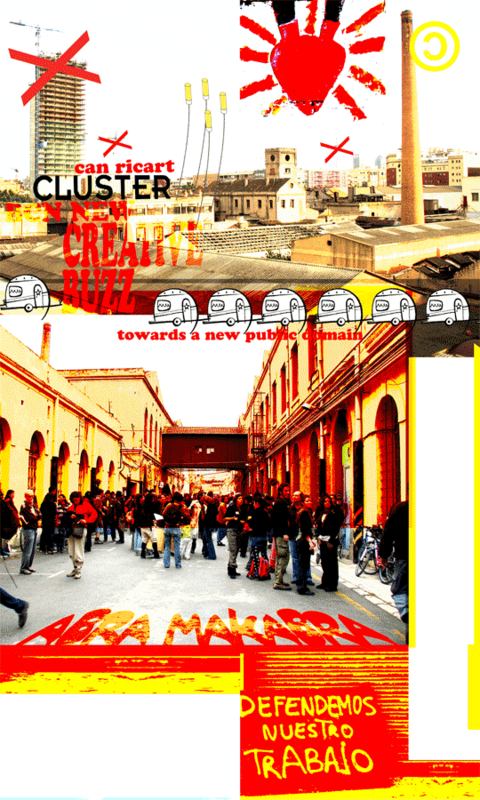 "a citizen, collaborative and independent grassroot project that conforms a structure of creative nodes (individual or collective) that puts in network to be able to give a service to the creators (in sciences, arts and technologies) of the city." > urban art and the public sphere. "visquem can ricart!" july 15, 2005.